The Seattle MC enlists his friends for a diverse and entirely collaborative hip-hop gem. Everybody needs a little help from their friends from time to time. On his new album Duo, Seattle alternative hip-hop artist Onry Ozzborn takes that idea to the extreme. All of Duo’s 16 tracks feature a guest collaborator/vocalist. It’s a loaded slate of Onry’s pals: Aesop Rock, P.O.S., Kimya Dawson, Rob Sonic, Sadistik, etc. 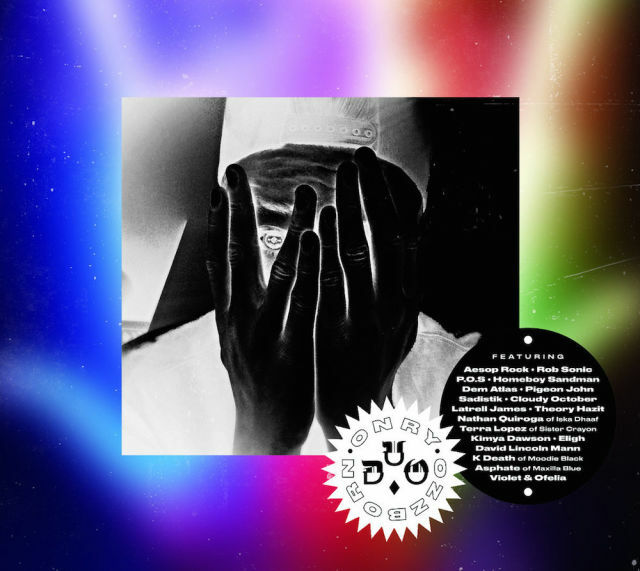 While Onry’s rapping acts as a through line to give the album a cohesive feel, the rotating parts around him make Duo an excellent and eclectic alternative hip-hop sampler. Onry writes rhymes from the vantage point of a scrappy cynic; the unassuming underdog with bite. Duo’s lyrics remain consistently sharp and peppered with clever cultural nods (from “hovering above the rim with waterboarded Wonder Twins” to “Casey Anthony and George Zimmerman on a trampoline”). Onry’s flow very deliberately floats along, drawing out or speeding up each cleanly enunciated syllable. While he doesn’t build his vocal approach around aggression, there’s never a malaise, as he stays on edge with numbers like “Wired” and “First Kill.” Since his delivery tends to be relatively understated, it can be easy to overlook how easily his voice naturally chameleons to each track’s partner. On the production side, things ebb and flow to match each guest. As a member of Seattle hip-hop groups Oldominion and Grayskul, Onry became known for a somewhat spacey style, but it’s still a readily accessible sound. It’s not nearly as far out there as some other Seattle hip-hop outfits like Shabazz Palaces. Even a listen to the first handful of tracks showcase the range Duo’s sonic style. Led by Latrell James’s buoyant energy, the second track “Stardom” boasts the bouncy energy of a party jam despite having a chorus of “Looking at all the stars / Up in the sky they shine so bright / one day they’ll all be crucified.” That’s immediately followed by the ominous tension and echoing beats of “Not Really” with Rob Sonic. Just two tracks later, backing shifts to a minimal, gritty, and dark space on “Turmoil” in order to find the wheelhouse of the always superb P.O.S. Two tracks stylistically stick out from the pack and mark a couple of Duo’s high points: “Neonerd” and “Flee the Colony.” Did you ever know you wanted folk punk hero Kimya Dawson to rap about riding the bus, loneliness, and Full House’s Kimmy Gibbler to the distorted tune of “I Am the Very Model of a Modern Major-General” from Gilbert and Sullivan’s The Pirates of Penzance, but paced like the original was covered in a coat of molasses? Well you do. And that’s what “Neonerd” provides. In another sonic tangent, Onry teams up with Nathan Quiroga of Iska Dhaaf to take things in a distinct indie rock direction with “Flee the Colony.” Before Onry starts rapping around the two-minute mark, the track could easily be mistaken for a dreamy, beat-heavy Iska Dhaaf tune. Duo serves as a testament to the beautiful power of mashing together artistic worlds in the name of collaboration. While the theme is the album, it never feels like a gimmick. Somehow there’s not a dud track to be found. It’s a risk to bring in so many different voices to one project, but Onry Ozzborn orchestrates it with precision while still finding space to let his own star shine.